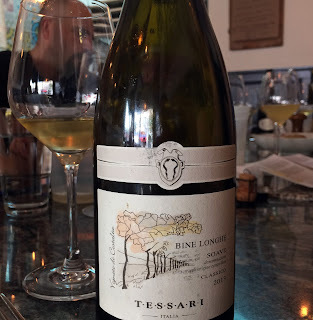 GARGANEGA (pronounced gahr-GAH-neh-gah), is the sole grape grown and used to produce 5 signature wines at Cantina TESSARI in Soave Classico Veneto in the northeast of Italy. These are the FIVE Expressions of Garganega, as Cornelia Tessari puts it. 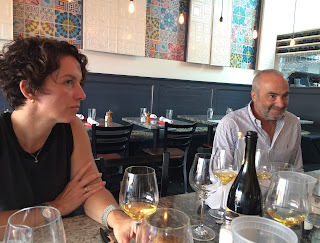 Sitting down with her recently, to lunch and to taste their wines, along with Stacey Ristuccia & Francois Dufour of Importer Matchvino, was a true gift and pleasure. The Centre Street Cafe' in Jamaica Plain provided an intimate and relaxed setting, with time to experience the wines with food and camaraderie. Cornelia is Granddaughter to winery founder Antonio Tessari, who originally started the Monteforte d’Alpone vineyard in 1933 as a cooperative with 1 hectare of land situated on the hillsides. Since then her father Aldo has purchased an additional 13 hectares and they now run vineyard and winery exclusively focusing on the one varietal. 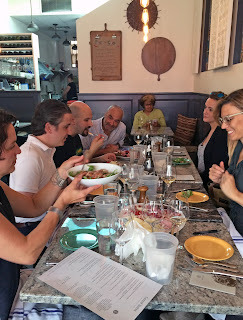 She and her brothers Antonio and Germano carry on the legacy of being family owned and run. They have been producing sparkling Garganega for 6 years. This day we were treated to two expressions of sparkling! TESSARI Garganega Brut 2014, made with the Charmat Method (2nd fermentation in the tank rather than in the bottle as in the traditional méthode champenoise) was a Golden Mouthful. Slightly toasty on the nose with ripe pear, hint of almond and light green apple on the tongue. 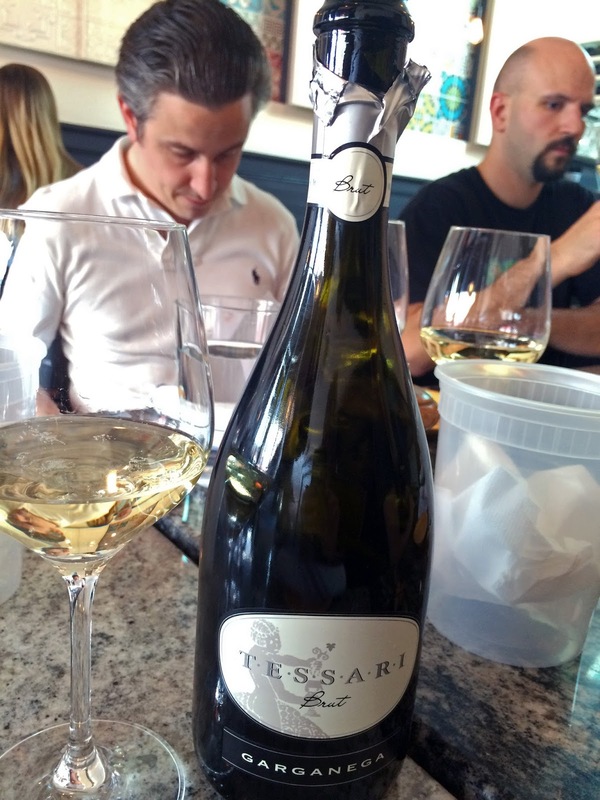 This is lush and clean, perfect for awakening the palate ... fresh & lovely to savor as well. Grown in volcanic soil rich with basaltic rock and clay, expressing area specificity to Garganega. AVUS Garganega Sur Lie is unfiltered and a distinctly unique expression of the grape. 2nd fermentation is in the bottle "con fondo" with natural yeasts providing richness exhibited by a certain yeastyness on the nose. All the while hints of cider balance with freshness. A small amount of Recioto must is also added. An example of carrying forward the traditions passed down from their grandparents prior to practices of modern sparkling techniques. Gorgeous and soulful, this is romance in a bottle! BINE LONGHE Soave Classico DOC 2013. This is Soave late harvest. "Bine Longhe" means "long rows", the grapes growing literally in one long row in a pergola trellis system that follows the contour of the the Costalta hill vineyard (Vigneto di Costalta). Shoots of select bunches of grapes are cut but left trellised as they dry. Vinification is the same as with Grisela, however they leave wine in the tank for 1 year and in the bottle for an additional year. Here I initially detected aromas of grapefruit and tropical fruit, followed by a certain salinity, like green olives. This was fuller bodied while restrained, clean and lean. A dichotomy? And truly asks to be enjoyed with food. I was enjoying a caesar salad with chicken, which was an apt pairing. 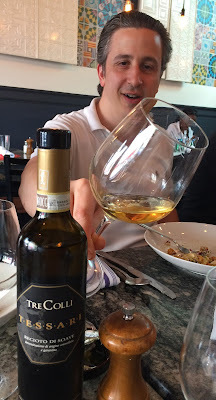 TRE COLLI Recioto di Soave DOCG. "Tre Colli" means "Three Hills", illustrating where the Tessari Estate is situated. Grapes are handpicked and dried for 6 months. As with the Bine Longhe, wine is left in the tank for 1 year and in the bottle for an additional year. Dazzling in color with hues of amber and honey, with an entirely fresh expression on the nose, deepened with very subtle hints of anise & fennel. Herbs and honey continue on the palate ... gorgeously harmonious, beautifully married! Matchvino imports TESSARI wines along with a handpicked portfolio of Estates making authentic and fine wines, exclusively Italian. They seek out "true wine; wines with a soul. Wines that capture the lands where they are grown". 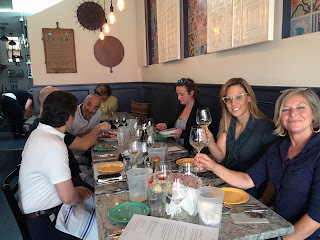 Thank you Cornelia, we hope to soon find your wines in MAINE!